Harold A. Pickett, a.k.a. "Slim Acres." 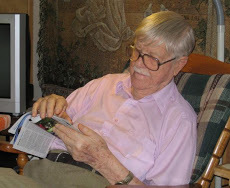 SLIM ACRES was the nom de plume of Ohio poet Harold Asa Pickett (1 January 1913—24 June 2009). This website will be dedicated to his poetry (some of which you can also read on the blog of his daughter Monnie Ryan), essays, and aphorisms. His grandson Scott Ryan is also at work on a CD of songs based on selected poems from his book Down Country Roads. We're not done adding content to this site yet, but there's plenty here to explore already. As of 25 April 2019, we've begun posting some selections from Slim's poems, ditties, and "Slimericks," and his "Slim Acres Says" newspaper feature (with some of the original illustrations). You can also listen to a few sample songs from the forthcoming CD. You'll find it all under "Slim's Works" on the navigation menu at the top of the page. More to come! We're also hoping we'll eventually be able to offer e-books and CDs for sale, so if you're interested, check back (or email us if you'd like us to keep you posted). Please come on in, make yourself at home, and enjoy what's here—which isn't everything yet, but we're working on it.